Renovation is largely complete on both the kitchen and bath, including the bonus work on the bedroom and hallway. We’re down to just a punch list and inspections. It’s amazing: gorgeous and lots of space. We spent this weekend moving back in, buying a few fixtures and decorative elements. I’ll post more pictures tomorrow. 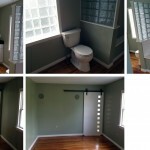 Today, have a look at the completed bathroom. The glass block and tub/shower stall are really cool. 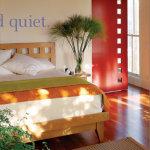 A standout, architectural piece is the new sliding barn door with rectangular cutouts. 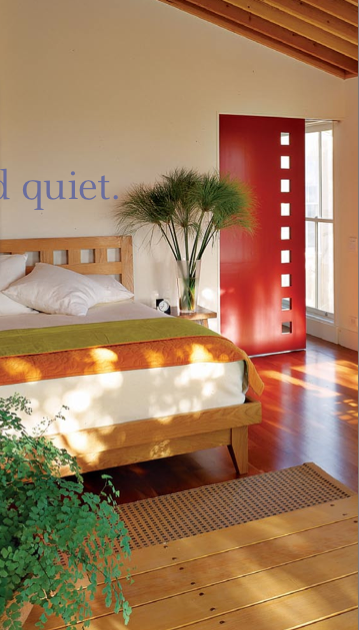 We got the idea for the barn door from the May/June 2005 issue of Inspired House. We’re going to paint ours a dark, aubergine purple. Here’s a partial photo from the magazine to show you the inspiration.